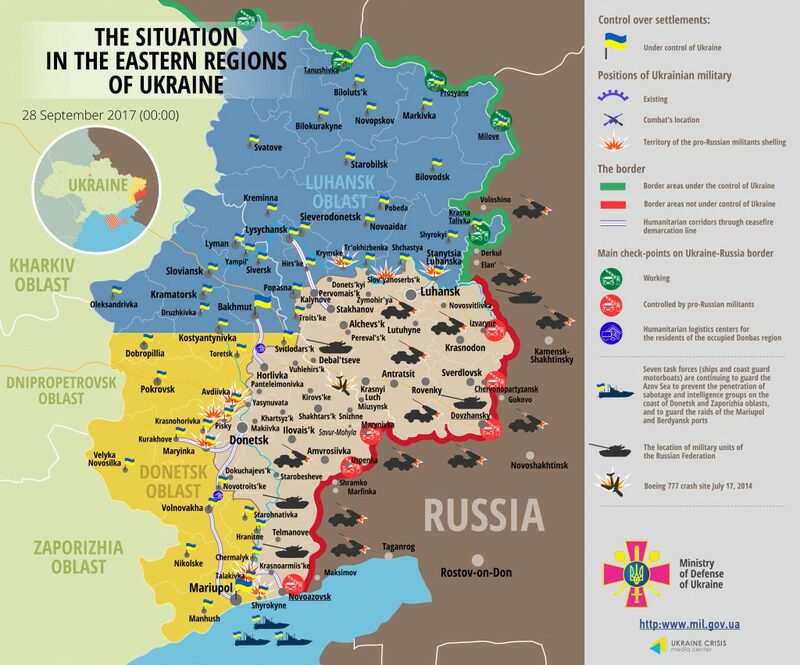 No Ukrainian serviceman was killed or wounded in action yesterday. Militants were the most active in Donetsk sector, where Ukrainian troops registered seven incidents of ceasefire violation, three of which involved heavy weapons. Three attacks happened in Luhansk sector, and five in Mariupol sector, informed Ukrainian Ministry of Defense spokesman on ATO- related issues Colonel Oleksandr Motuzyanyk at a press briefing at Ukraine Crisis Media Center. In Donetsk sector the vicinity of Avdiivka was the main flashpoint. “The enemy was active both in the south – in Spartak and in the east – in Yasynuvata. Russian proxies engaged fake position of Ukrainian Armed Forces, and then a real one,” said Oleksandr Motuzyanyk. Ukrainian troops responded with fire. Militants were firing from small arms between 21:00 and 23:00 in the vicinity of Avdiivka industrial area. They also shot in Kamianka at lunchtime. “The situation was restless in the vicinity of Donetsk airport too. The enemy keeps attacking our strongholds in Pisky and Nevelske. Nevertheless, the situation in Pisky is the most restless and the attacks last the longest there,” said Col. Motuzyanyk. The ceasefire held near the occupied Horlivka and in Svitlodarsk area. In Mariupol sector militants continue shooting in Maryinka and in the southern part of the sector. Russia-backed subversive reconnaissance teams opened fire from small arms in Maryinka in the morning. In the southern part of the sector hostile attacks took place in Hnutove, Talakivka and Shyrokyne. Militants used mortars in Talakivka. In Luhansk sector Russian proxies opened fire in Krymske, Lobachevske and Stanytsia Luhanska in the evening. Militants used grenade launchers and small arms. Each provocation was up to one hour long. Fire control measures still continue in the ammunition depot in Kalynivka, Vinnytsia region. “We managed to take the situation under control. Engineers are checking the territory of the depot and adjacent areas, especially inhabited localities. Resident of the military camp and the adjacent town started coming back home,” elaborated Col. Motuzyanyk. Report on the military developments as of September 27 is available here. Interactive data on the shelling: chronology shelling chart and the interactive map.